At some point in the last year, I got really excited about Standard Breading Procedure: flour, egg wash, breadcrumbs. 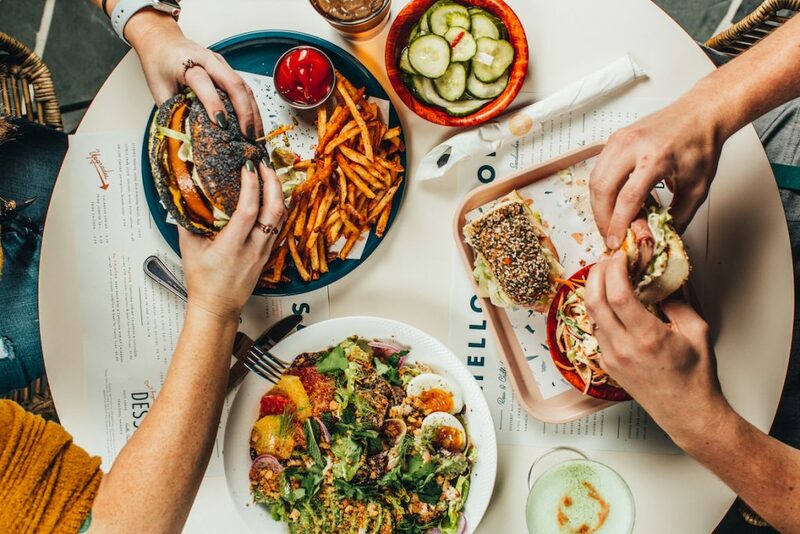 Katy, of course, is Joe’s wife, the other half of the visionary duo that turned a tiny 100-year-old brick building on Davidson’s Main Street into a nationally-recognized foodie sensation. Despite Kindred’s wild success, the couple knew their next venture couldn’t (or shouldn’t) repeat the marbley fineness and elevated small-platedness of Charlotte’s culinary darling. It had to be different, but different how? The next history-laden location would determine that, they figured. And Joe had just found it. “Oh great,” Katy thought. “Another Joe idea.” But then she visited this place on the water, listening as the increasingly giddy chef ran through the possibilities. Chicago-born Katy, meanwhile, found herself wondering how people manage to find this hideaway in little old Cornelius, North Carolina on a map. It was both the dead end of a road and the lonely occupant of a cove. 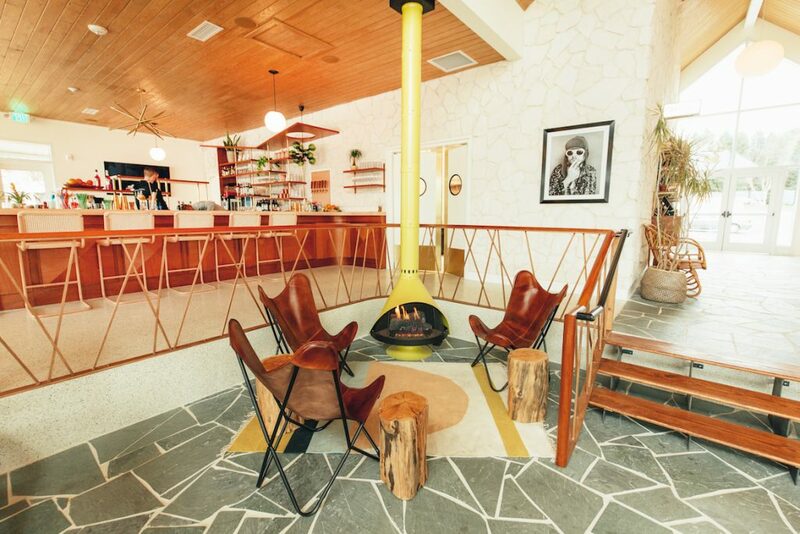 Contoured in rickety charm, the fixer-upper—with its sprawling deck-with-a-view, twenty-something docks, and tiki bar waiting to happen—was a diamond in the rough. A seafood joint not at sea. An oasis in a quiet lake town. The Palm Springs of Lake Norman, Katy Kindred thought, jokingly at first. 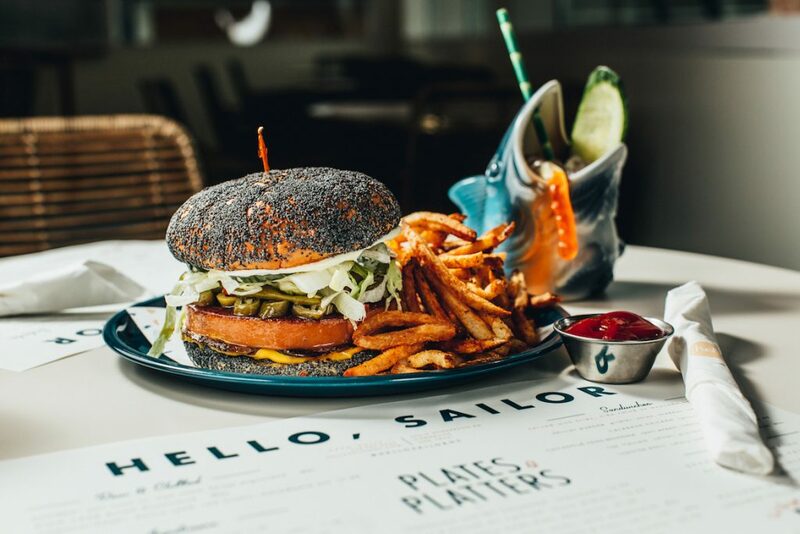 But then a bonkers vision of fried seafood in mid-century digs wouldn’t go away, and soon the words “hello, sailor” rolled off the tongue way too easily. 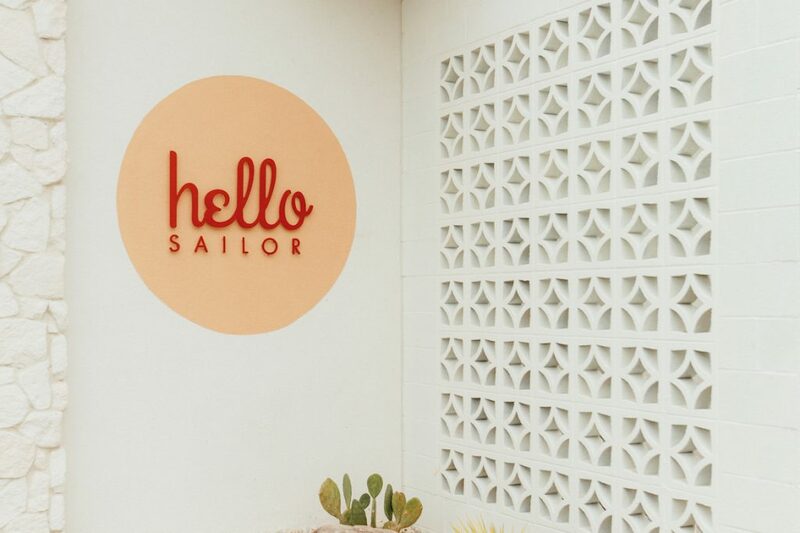 That’s Hello, Sailor: nostalgic and stubbornly of a particular time, but in a good way. The name is a little tongue-in-cheek because the concept is so. Silly without being ridiculous, Hello, Sailor is carefully playful. 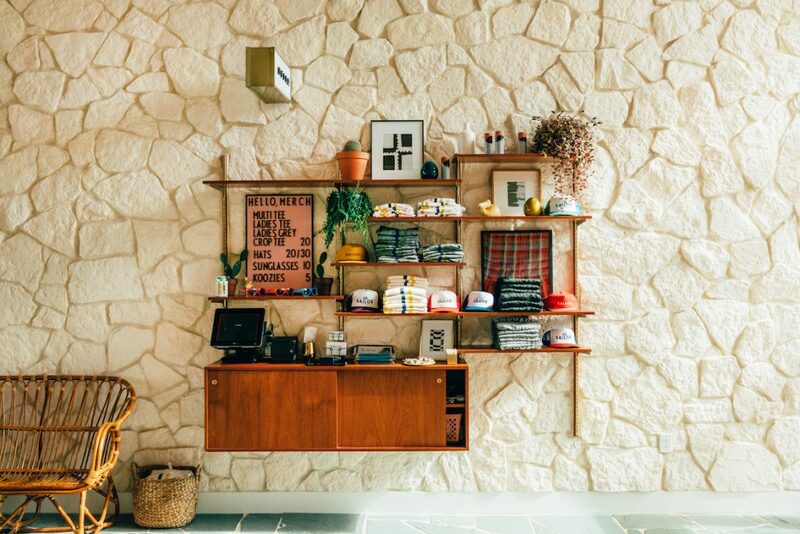 The restaurant’s entrance greets visitors with the unlikely reality that Frank Lloyd Wright exists in the same universe as strategically placed, shamelessly self-promotional restaurant merchandise. The paper placemat menu, a relic of a simpler time, gets an aesthetically pleasing update. And these are just first impressions. 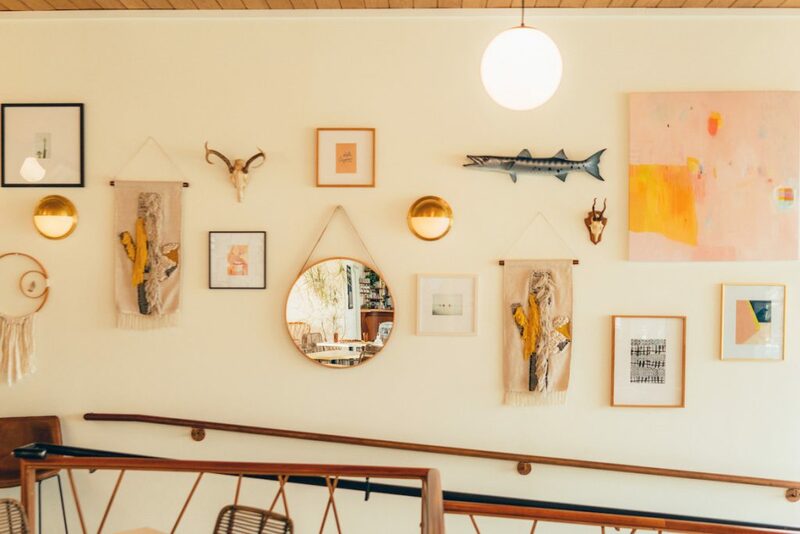 Throughout, the Carolina seafood joint gets a contemporary facelift while the mid-century ‘modernity’ of it all gets muddled. The place is less serious than its West Coast brethren and more fun than inland seafood has any right to be. It isn’t Kindred, but much of what makes Kindred work also suits Hello, Sailor. 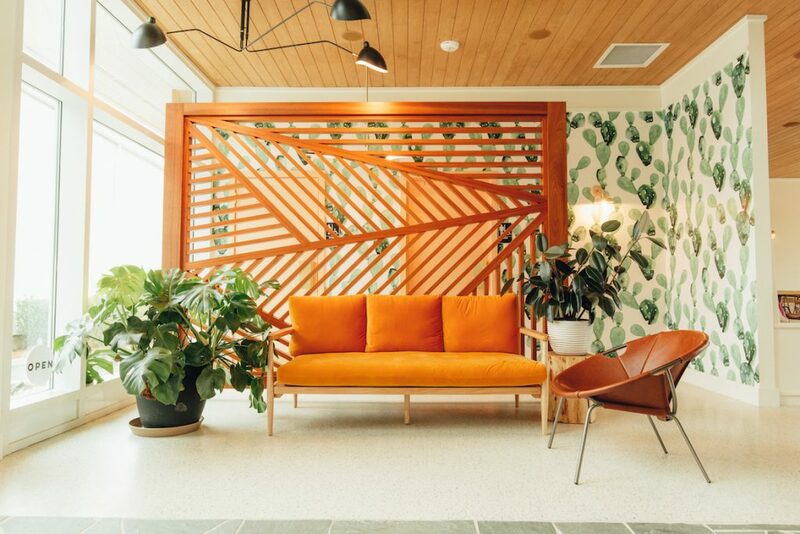 Katy’s eye for cohesive interiors, for one, ensures that the Palm Springs hotel vibe is immersive, from the bar to the bathrooms. 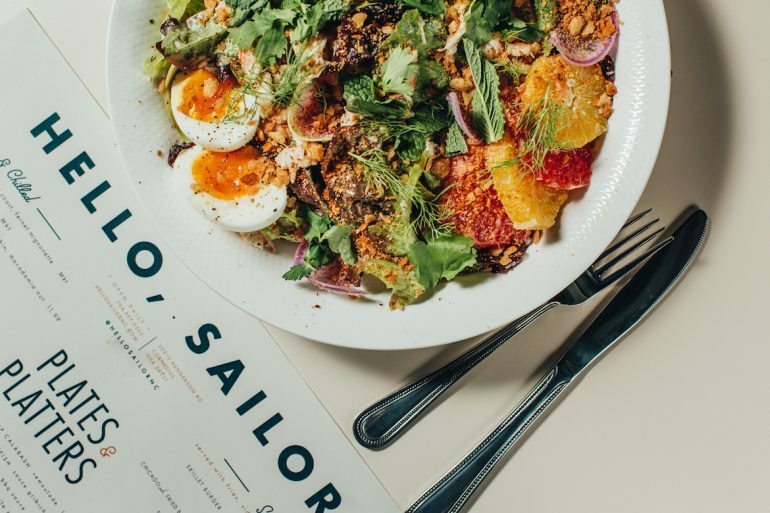 Her front-of-house game hasn’t slouched any either: Fine dining or no, good service at Sailor is a priority. It shows. Blake Pope, the jack-of-all-hip-trades who has been with the Kindreds since day one, brings the same level of care to branding. 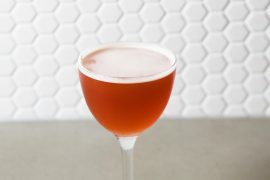 He’s also found time to craft a bar menu which filters alcohol into an institution that, by its nature, has always been nonalcoholic. 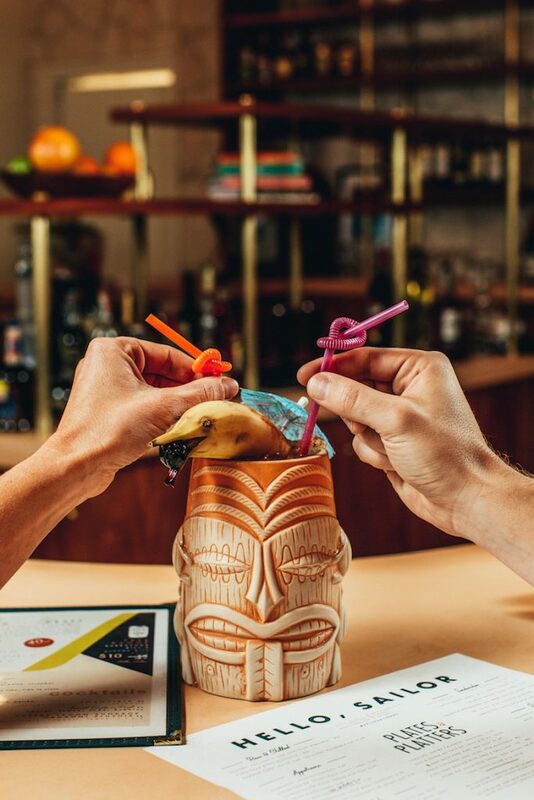 And so the bar slings 40-ounce Miller High Lifes and cocktails in marlin-shaped tiki mugs. This ain’t your grandma’s Sunday haunt, but grandma Pope would probably be proud. 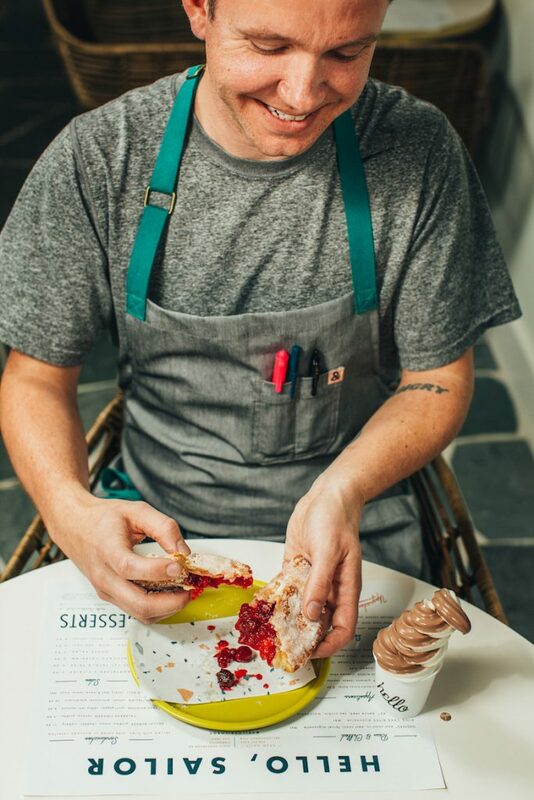 Pastry chef and resident shoulder devil Justin Burke Samson, meanwhile, takes all those classically unrefined desserts from your childhood and reveals just how refined they might’ve been the whole time. 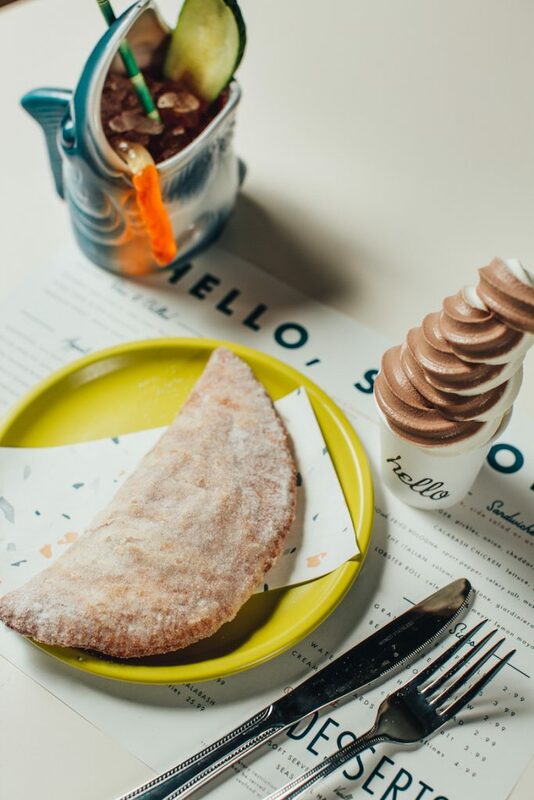 Sailor’s soft serve embraces the essential marshmallowy consistency but reinvents that base with Italian meringue. Lake Norman summer, meet Justin. You two should get along. And then there are the hand pies, which must be enjoyed with as little haste as possible. Justin Burke Samson’s hand pies are a deep-fried, sugar-coated (like, really coated) crisp on the outside, and a gooey, fruity mess on the inside. To dumb down their tooth-achy sweetness just a little, they’re tossed in sugar and salt. This savory-sweet coating complements the richness of the distinctive crust—oh yeah, they’re fried in beef fat—but it also says “hey, this is a dessert, so get prepared.” These hand pies are the kind of piping hot desserts that bring about involuntary shudders of joy: Nothing, your taste buds insist, should be this good. Oh, and there’s a new filling every week. Justin is hell-bent on reviving nostalgic desserts in a way that reminds us why they became fondly remembered in the first place: His latest addition to the Sailor menu is a German chocolate poke cake that’s just like “something his grandma would’ve made for a potluck.” A massive prism of thick, fudgy chocolate, every slice is filled and topped with delightfully unavoidable chunks of coconut. 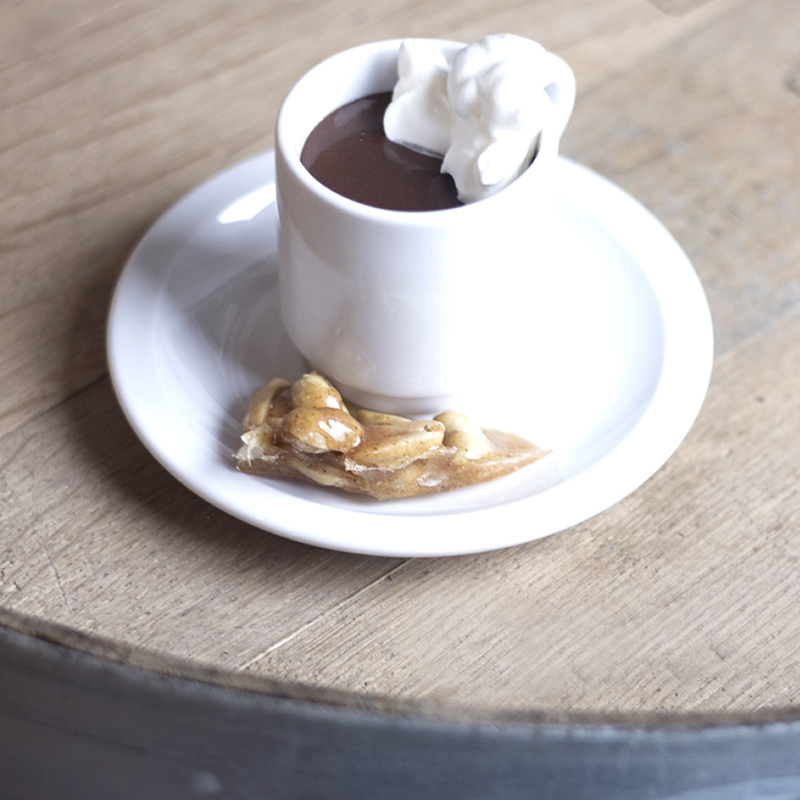 Saving room for pie, though an absolute necessity, won’t be easy. In this new kitchen, Chef Joe Kindred is once again utterly in his element: This place is a hometown playground for him, and nostalgia lurks in every ounce of breading. 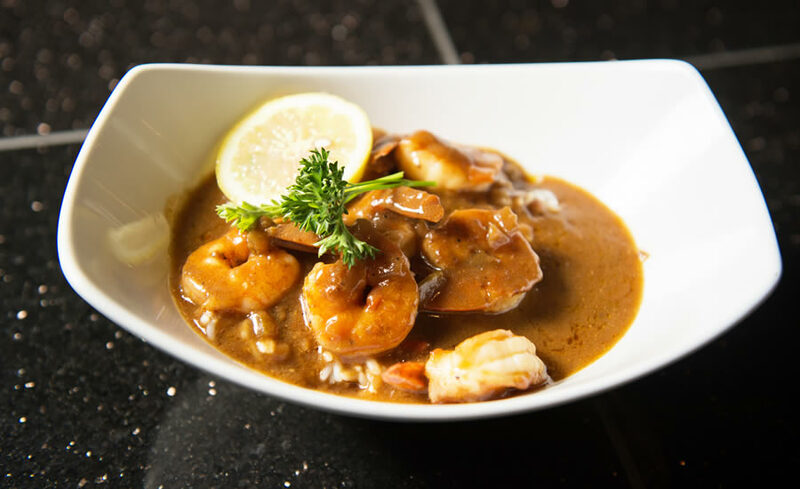 That was right around the time Joe recruited Hello, Sailor’s Chef de Cuisine, Craig Deihl—a Lowcountry name synonymous with chef-driven indulgence… and versatility. 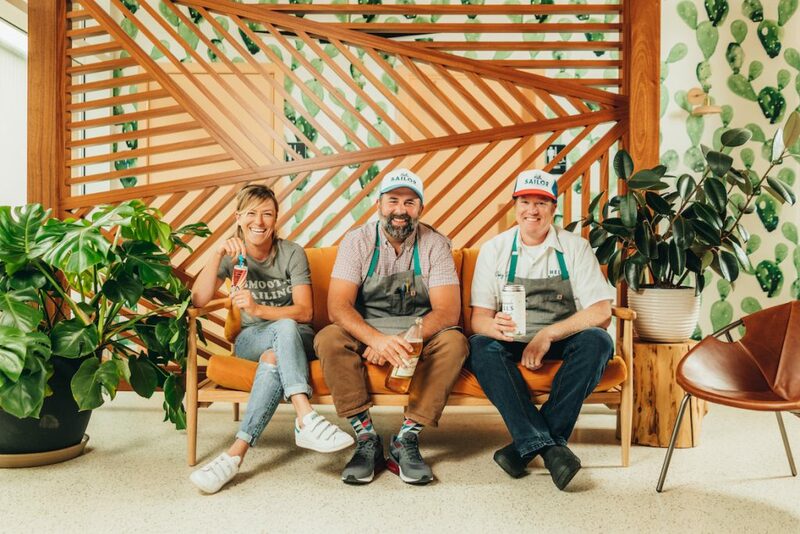 A two-time James Beard semifinalist for Best Chefs in America (and nominee two other times), Craig achieved national fame for the sheer creativity in his work at Charleston’s Cypress and Artisan Meat Share. 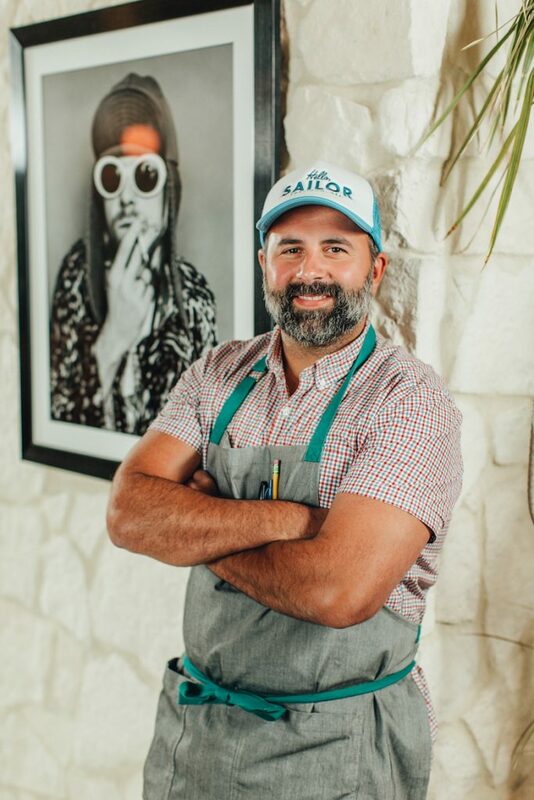 Despite his renown in one of the South’s great food cities, the newest addition to Sailor’s crew is humbly thrilled by the freedom that comes with cheffing the place. 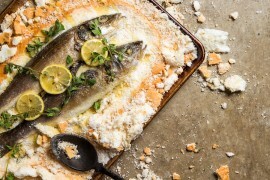 We’re rethinking the classic fish camp dishes alongside the chef-driven stuff that pulls people out of their comfort zones. I’m just excited that we get to play with food here. 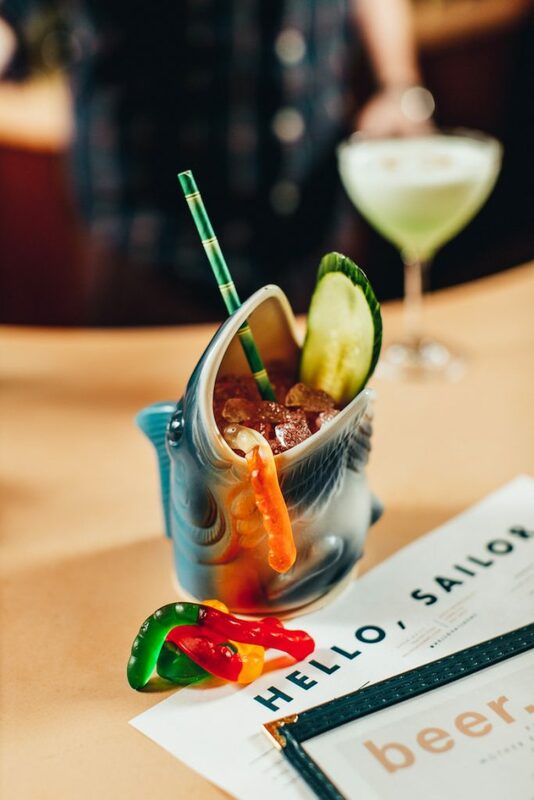 If the kitchen at Hello, Sailor has a mantra, that’s probably it: Play with your food. 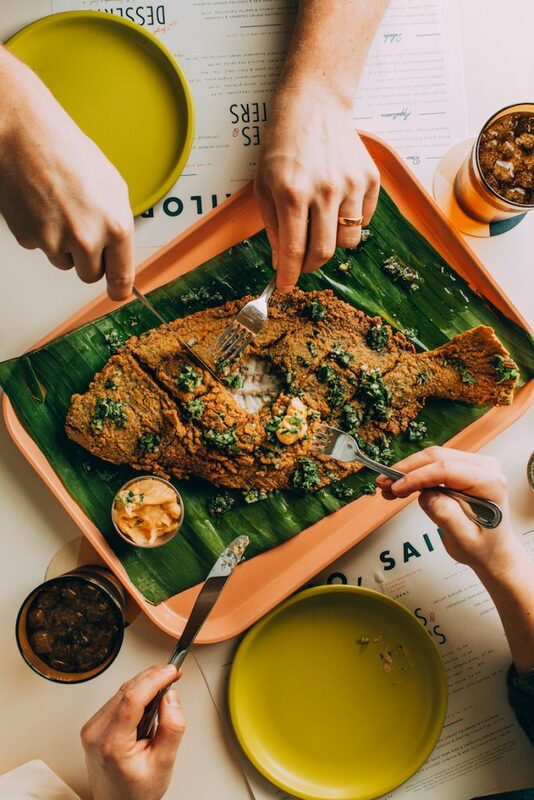 The one rule of the fish camp menu is that there are no rules. The whole thing is the end result of a series of frenzied experiments and a gamut of religious taste testing. That’s an origin story typical of every item you can order here. 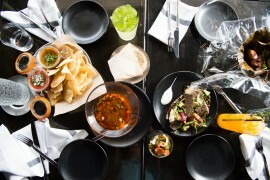 Everything else on that sheet of paper gets the same playful experimentation, often finding simple but inspired ways to mash up California technique with Southern flavor—or vice versa. Watermelon comes with sea salt and chile. The Crab Louie salad gets brown butter saltines. 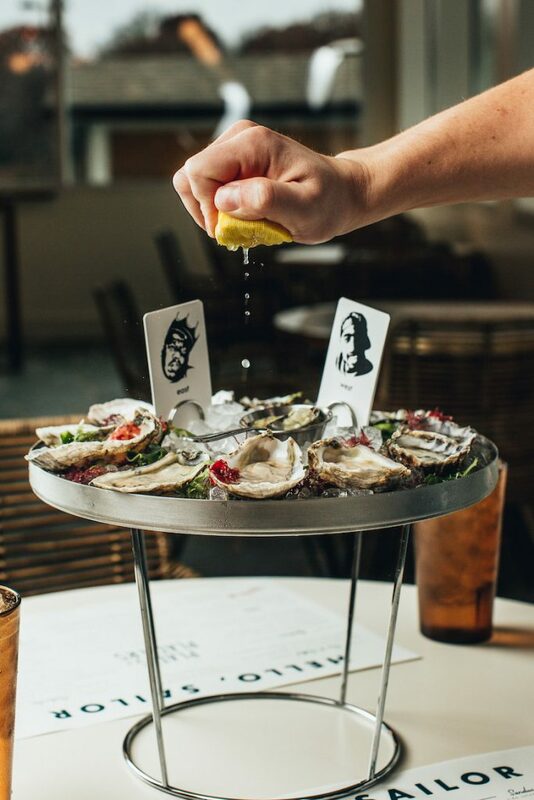 East Coast and West Coast oysters are hilariously pitted against each other (and labeled, naturally, with the glowering mugs of Biggie and Tupac). The real star of the whole show, of course, has seen the most extensive tests, earning its status as the inaugural course of every meal: No seafood joint can exist without hushpuppies. It is written. Somewhere. 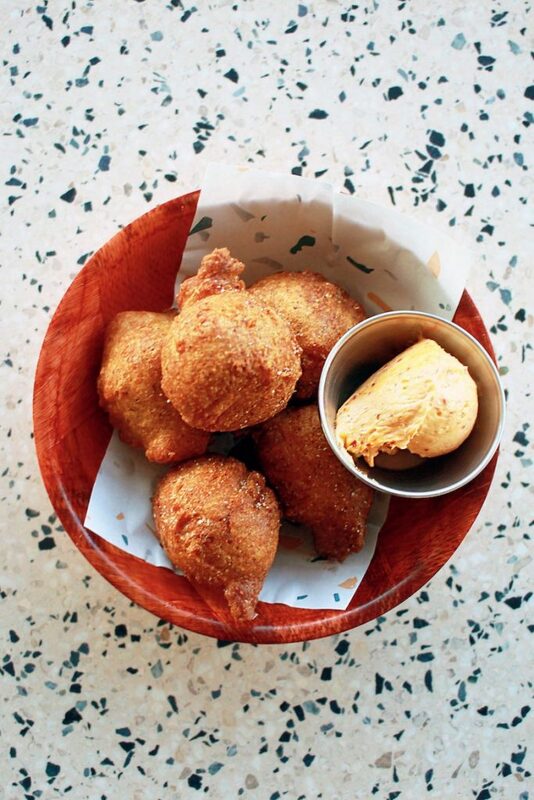 A dichotomy of deep-fried crunch and heavenly fluff, Hello, Sailor’s hushpuppies are the epitome of simple food made memorably complex. Their just-browned-enough exterior, when breached, releases the unmistakable aroma of their base: Jimmy Red Cornmeal from South Carolina’s Geechie Boy Mill. Yeah, well, they’ve found it. The pups are hearty but miraculously airy: Cubes of ice-cold butter, thrown into the mix at the last second, fix the batter with a beignet-like consistency, while the texture of fresh-grated onions offsets that buoyancy. 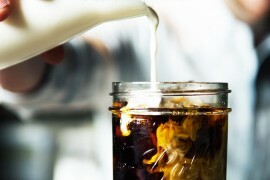 They’re so good you don’t even need the yuzu kosho honey butter. But then again, you do. This (frighteningly) affordable starter finds Joe Kindred trying his damnedest to dethrone his own milk bread. He gets close. 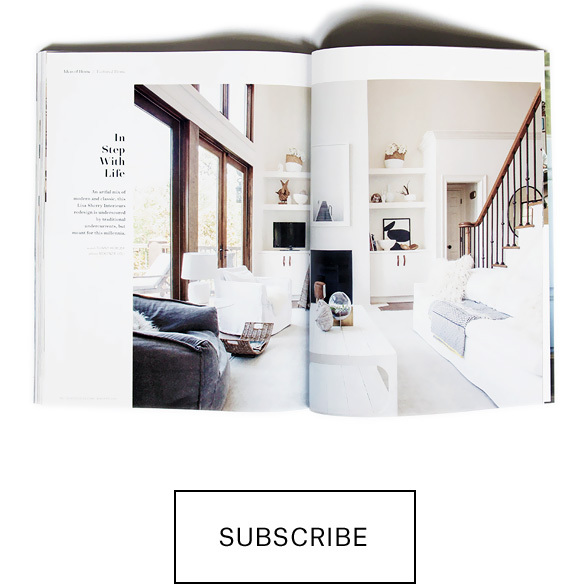 Finally, the Calabash-style bits continue that tradition of ongoing refinement. Joe doesn’t do Calabash per se—it’s his take rather than a simple imitation. The kitchen has spent a year and a half perfecting their chicken sandwich. Despite the bird’s otherworldly tastiness, Joe alleges it’s not their best effort, because “the best one isn’t ready yet.” The seafood breading, on the other hand, might just be right where they want it—if Joe’s sermonizing on the subject is any indication. These are the intonations of a man in love. The whole concept feels very near to the chef’s heart because, well, it is: The legendary Harbor Lights menu from Joe’s childhood hangs in his office. There’s a Piedmont-bred authenticity to each dish that makes every patron a close friend of the chef. 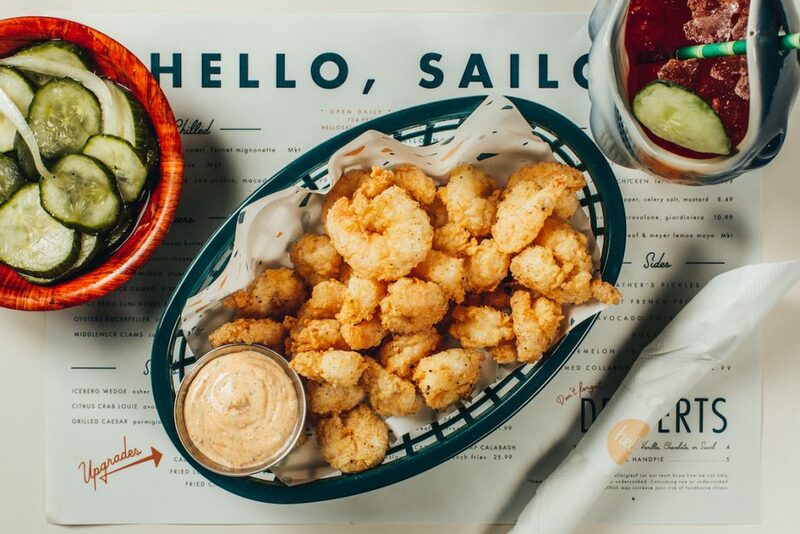 His other restaurant may bear the name, but it’s at Hello, Sailor, over Friday night fish platters, that we become part of the Kindred family. We’re having fun here. We’re chef-driven, but we don’t take ourselves too seriously. Have a piece of pie.